HM6 Final Edition 8 ex. 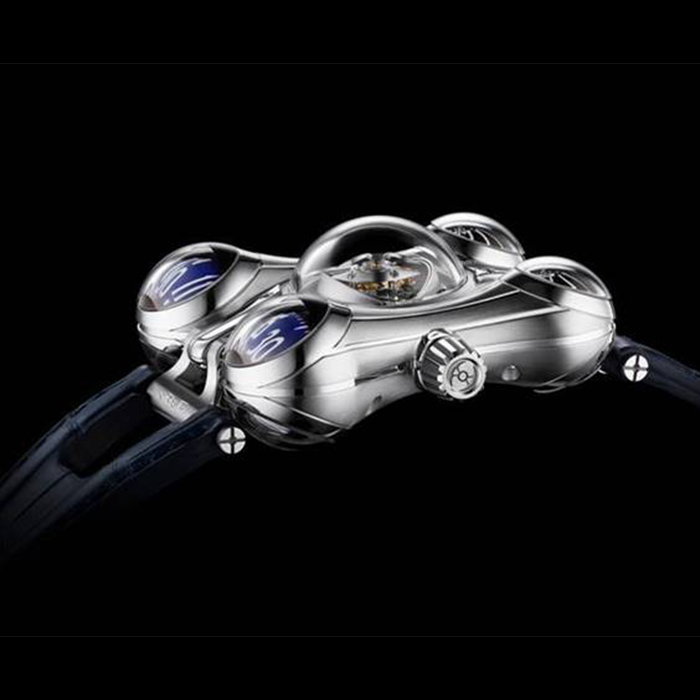 MB&F | 233'000 € Tax inc. 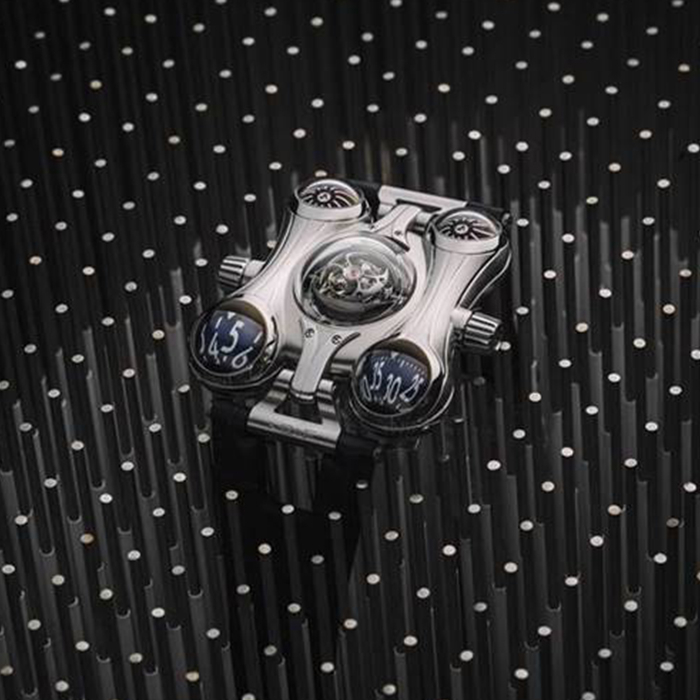 The HM6 is a machine like no others, created by a brand like no others: MB&F. 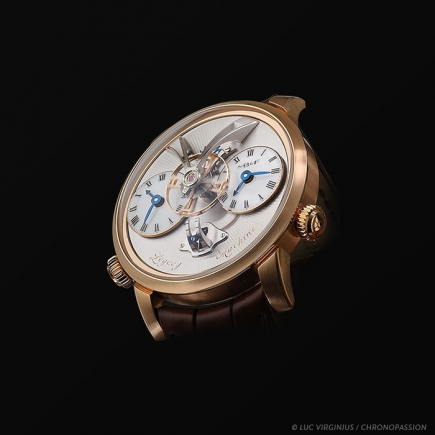 The charismatic Max Büsser (and his friends) have once again created here something more than a timepiece, which we can call without any hesitation a horological machine. The HM6 is the symbol of futuristic watch design, a true alien in the world luxury timepieces, that invites any watch lover to travel into space and, why not, to reinvent the meaning of time. Max Büsser has decided that this would be the final edition of his Horological Machine No 6 and has therefore decided to baptize it the “Space Pirate”: you had better be quick and catch it before it disappears forever…into Space. Per se, the nature of the HM6 timepiece has not changed tremendously. 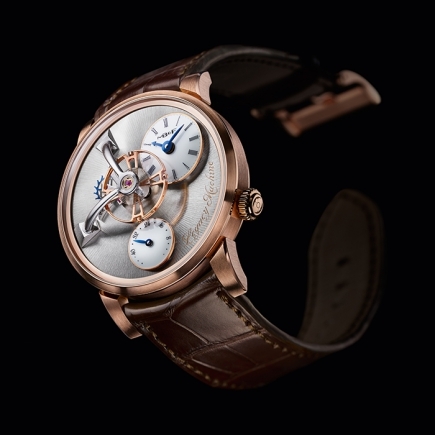 This horological machine with an unbelievable case shape houses the same engine as in the original version of the “watch”. More than three years of development were needed to create the movement of the HM6 Space Pirate. 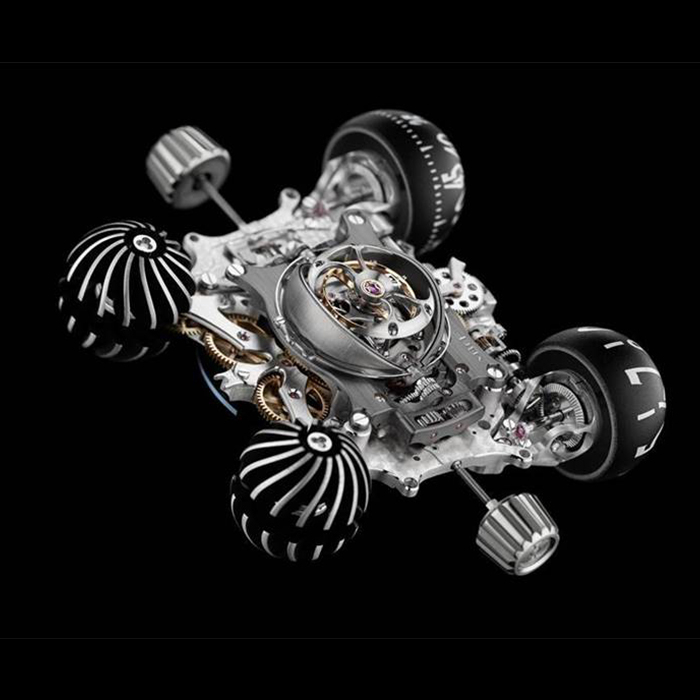 Not surprising when one observes the dimensions of the watch, the complexity of the movement and the geometry of the elements that need to be mechanically activated. Several hundreds of components that need to work together seamlessly under a multitude of sapphire glasses: a sapphire dome for the space dedicated to the hours, a sapphire dome for the space dedicated to the minutes, one big central sapphire dome for the space dedicated to the tourbillon and, finally, two sapphire domes fin the upper part for the turbines regulating the winding of the watch. The semi-spherical hours and minutes indicators placed under the sapphire domes in the lower part of the watch are machined in solid aluminium blocs. In the case of the original HM6, their colour would therefore perfectly match the colour of the case, then in titanium. These time indicators seem to be floating in space and are positioned on vertical jewel bearings, at a 90° angle compared to the movement. A rare prowess, extremely difficult to achieve on such a timepiece. Every element of the Horological Machine Space Pirate is fascinating to observe: the design of the case, the design of the movement, the movement of the tourbillon and of course the bubbly shapes provided by the sapphire domes. 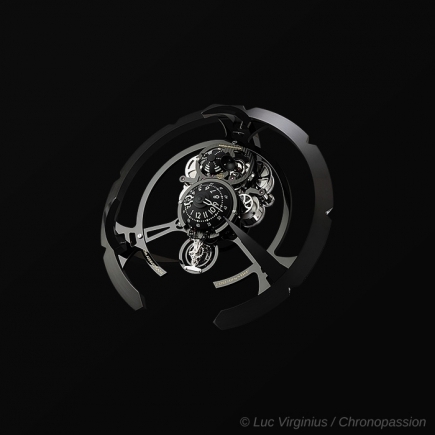 The development of the tourbillon movement for the Horological Machine Space Pirate was a specific R&D journey on which Maximilian Büsser and his Friends have embarked. 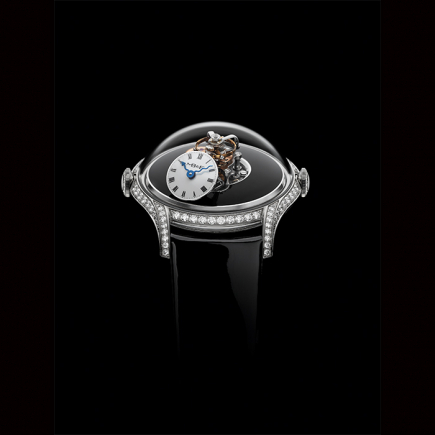 Indeed, the entire development of the tourbillon was conditioned by the space available under the sapphire dome. The space being too small for the upper bridge of a classic balance wheel, the option of a flying tourbillon was pursued. 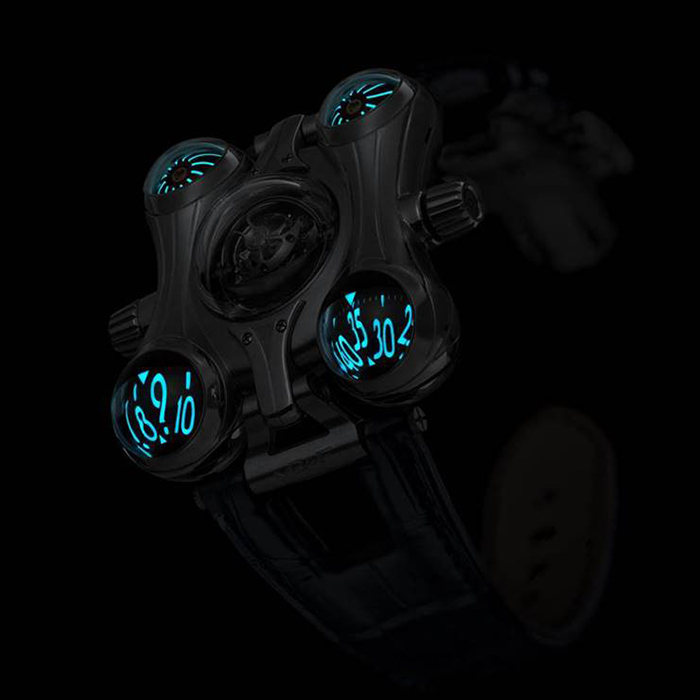 A quite unique and spectacular feat of Busser’s Space Pirate is the retractable protective shield that can be mechanically activated using the crown positioned on the left side of the case. As for the two turbines positioned under the upper sapphire domes, they were also machined in blocs of solid aluminium. 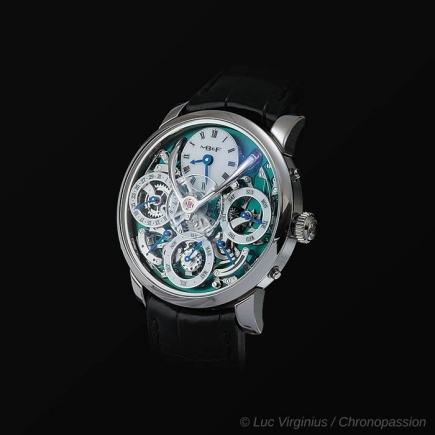 These turbines are activated by the movement of the rotor positioned on the back of the watch. 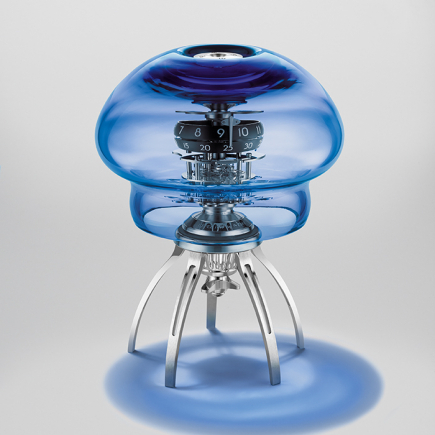 For the final edition of the Space Pirate, so unique for its design, its futuristic case, its sapphire domes and its unique interpretation of time, Maximilian Büsser wanted to complete its legacy with a version in a steel case. After versions in titanium and in gold, a steel version was still missing to close the HM6 circle. 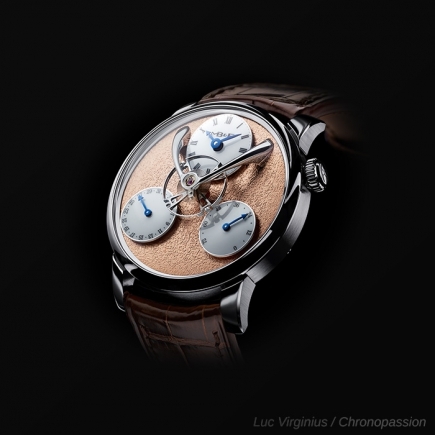 The engine of this new declination remains the same, so as the shape of the case with its two superior domes for the turbines, two inferior domes for the hours and minutes, and central dome for the tourbillon movement. Of course, the shield is still present and actionable on demand to cover up and protect the tourbillon movement from alien interference. 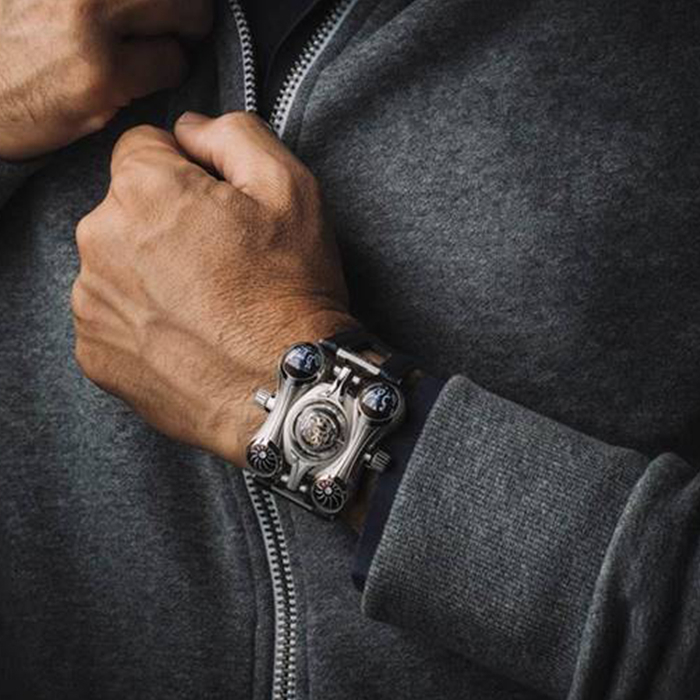 The Horological Machine Space Pirate in steel is a real collector piece, with only eight units being produced. 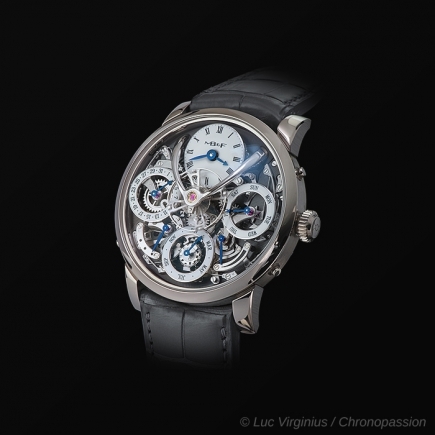 The timepiece is mounted on a blue leather strap, perfectly matching the blue colour of the hours and the minutes positioned under the two lower sapphire crystal domes. 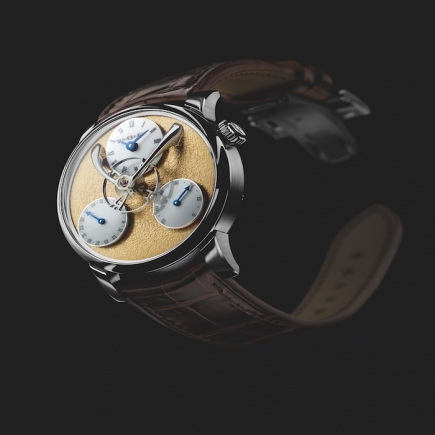 The steel case is polished around the domes and satin-brushed vertically between the upper sapphires and lower sapphires, generating an additional sense of movement. A timepiece that is definitely a pirate and that will definitely take you on a journey into space. HM6-SV: Sandwich construction of two transparent sapphire crystal plates on either side of a central precious metal case band, in 18K 5N+ red gold or platinum 950. HM6 Alien Nation: sapphire crystal with white gold aliens and 4 different gasket colours. 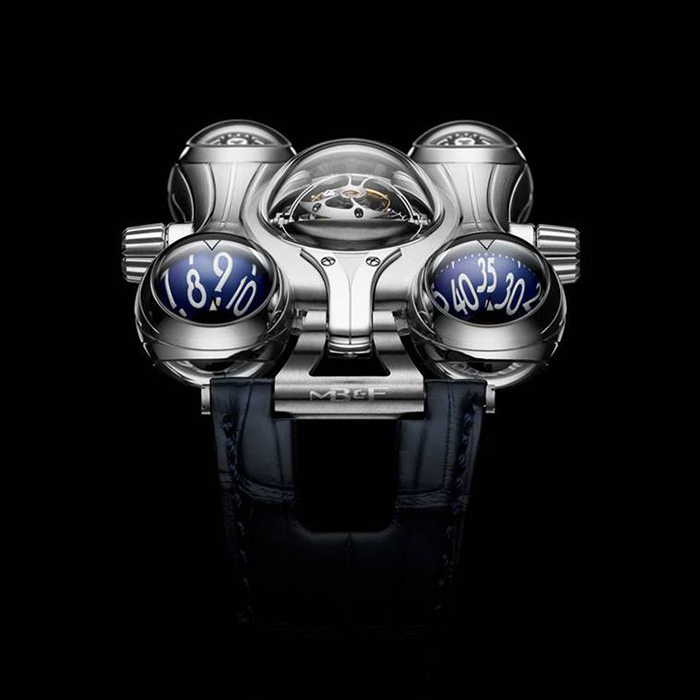 10 sapphire crystals: 9 domed (4 for the hour and minute indications, 4 for the turbines, 1 for the tourbillon) and one flat (display back); 2 additional sapphire crystal plates for the SV and Alien Nation editions; and additional case band in sapphire crystal for the Alien Nation. Hand-stitched calfskin strap for the HM6 Ti and RT; alligator strap for the HM6-SV, HM6 Alien Nation and HM6 Final Edition. Custom designed folding buckle matching the case material.